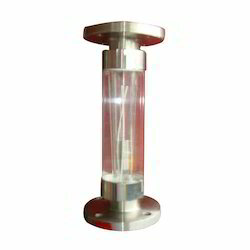 Prominent & Leading Manufacturer from Vadodara, we offer acrylic body rotameters, acrylic flanged rotameter, acrylic plastic body rotameters, flow rate rotameter, flow measuring instrument and liquid flow sensor. 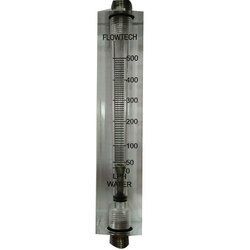 FLOWTECH Acrylic Body Tube Variable Area Flow Meters (Rotameters) are intended for general in line metering applications (i.e. 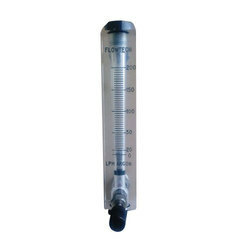 for Gas & Liquid) where operating conditions are with the limitations of Acrylic Body metering tubes. These are the principle of Variable Area. The float moves freely up and down tapered Acrylic body Tube with fluid flow from bottom to top. The float takes up a position where buoyancy forces and the float weight are balanced in proportion to flow rate. The Vertical position of the float as indicated by scale is the measure of the instantaneous flow rate. 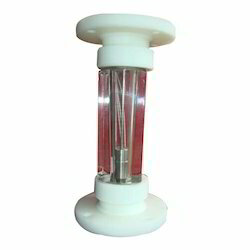 Precociously machined from imported transparent solid acrylic block tapering tube is done by special tools. 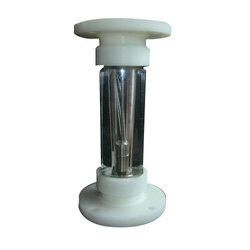 Suitable for water, saline water, air N2 H2 and natural gases. Available from 15 NB to 100 NB pipe size and ranges between 30 to 40,000 LPH of water at ambient temperature. High & Low Flow switches on request. 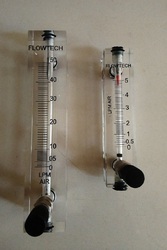 Flowtech Make Acrylic Body Rotameters. 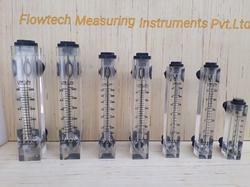 "FLOWTECH" Acrylic Body Tube Variable Area Flow Meters (Rotameters) are intended for general in line metering applications (i.e. 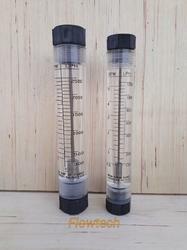 for Gas & Liquid) where operating conditions are with the limitations of Acrylic Body metering tubes. These are the principle of Variable Area. The float moves freely up and down tapered Acrylic body Tube with fluid flow from bottom to top. The float takes up a position where buoyancy forces and the float weight are balanced in proportion to flow rate. The Vertical position of the float as indicated by scale is the measure of the instantaneous flow rate. “FLOWTECH” Liquid Flow Sensor Variable Area Flow Meters (Rotameters) are intended for general in line metering applications (i.e. 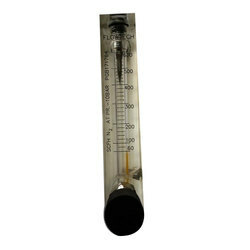 for Gas & Liquid) where operating conditions are with the limitations of Acrylic Body metering tubes. These are the principle of Variable Area. The float moves freely up and down tapered Acrylic body Tube with fluid flow from bottom to top. The float takes up a position where buoyancy forces and the float weight are balanced in proportion to flow rate. The Vertical position of the float as indicated by scale is the measure of the instantaneous flow rate. 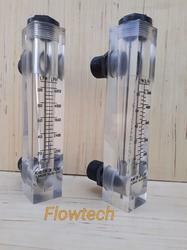 Flowtech Make RO Water Acrylic Body Rotameters. 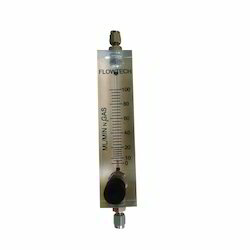 “FLOWTECH” Acrylic Body Tube Variable Area Flow Meters (Rotameters) are intended for general in line metering applications (i.e. 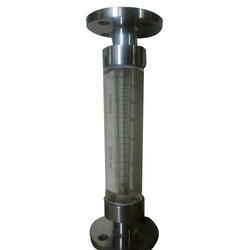 for Gas & Liquid) where operating conditions are with the limitations of Acrylic Body metering tubes. These are the principle of Variable Area. The float moves freely up and down tapered Acrylic body Tube with fluid flow from bottom to top. The float takes up a position where buoyancy forces and the float weight are balanced in proportion to flow rate. The Vertical position of the float as indicated by scale is the measure of the instantaneous flow rate. Available from 1/4" NB to 100 NB pipe size and ranges between 30 to 80,000 LPH of water at ambient temperature. 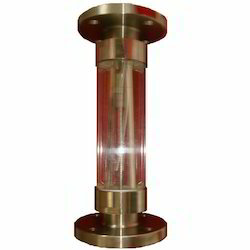 Available from 15 NB to 100 NB pipe size and ranges between 10 to 80,000 LPH of water at ambient temperature. Packaging Details: Wooden Cages & As Per Customer Requirements. 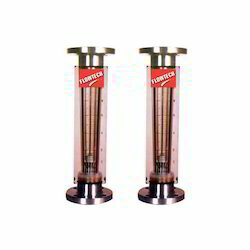 Detailed Product Description DESCRIPTION: FLOWTECH Acrylic Body Tube Variable Area Flow Meters (Rotameters) are inten DESCRIPTION: FLOWTECH Acrylic Body Tube Variable Area Flow Meters (Rotameters) are intended for general in line metering applications (i.e. 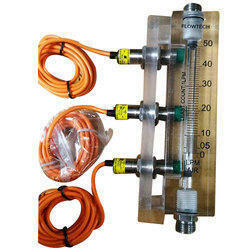 for Gas & Liquid) where operating conditions are with the limitations of Acrylic Body metering tubes. These are the principle of Variable Area. The float moves freely up and down tapered Acrylic body Tube with fluid flow from bottom to top. The float takes up a position where buoyancy forces and the float weight are balanced in proportion to flow rate. The Vertical position of the float as indicated by scale is the measure of the instantaneous flow rate. 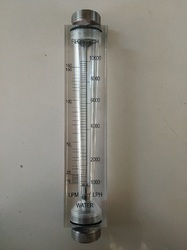 When fluid or gas flows through a taper tube containing a float, a pressure difference of P1 and P2 is created between upper and lower side of the float. The float moves upwards by a force obtained by multiplying the pressure differential by the maximum cross sectional area of the float. Due to taper tube, as the float moves upwards, the fluid passing area increases as a result of which the differential pressure decreases. Upward movement of float stops when the dead load is dynamically balanced by the differential pressure. 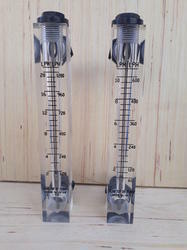 Tapering of metering tube is so designed that the vertical movement of the float becomes linearly proportional to the rate of flow and the scale is provided to read the position of the float, thus giving birth to flow rate indication. Based on Bemoulli's theorem, the principle mentioned above can be theoretically expressed as follows. 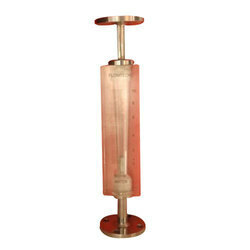 We bring forth a range of Gas Flow Rotameters that is designed to provide maximum accuracy, visibility and ruggedness. Our range is procured from reputed vendors and available in various sizes & ranges of temperature with high and low flow alarms. 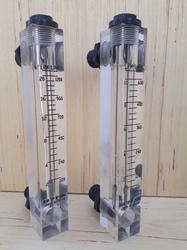 These are generally used for metering flow rates in chromatography, indicating and controlling materials in manufacturing processes, liquid and gas measurement in laboratories and other applications. 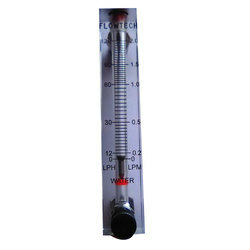 Flowtech Acrylic Body Tube Variable Area Flow Meters (Rotameters) are inten. Flowtech Acrylic Body Tube Variable Area Flow Meters (Rotameters) are intended for general in line metering applications (i.e. 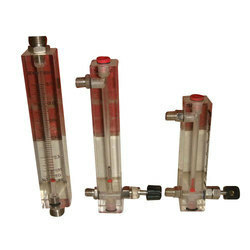 for Gas Liquid) where operating conditions are with the limitations of Acrylic Body metering tubes. These are the principle of Variable Area. The float moves freely up and down tapered Acrylic body Tube with fluid flow from bottom to top. The float takes up a position where buoyancy forces and the float weight are balanced in proportion to flow rate. The Vertical position of the float as indicated by scale is the measure of the instantaneous flow rate.